Everyone loves a pet in a costume! One of our favorite ideas is adding an oversized TY collar to your four legged family member, turning him or her into a life-sized Beanie Baby. Check out some of these other great ideas! 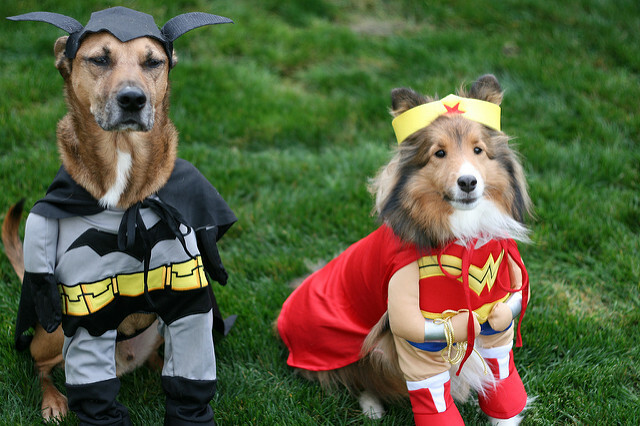 Feel free to share your pet costumes with us too. Painted Skeleton. If your dog or cat has solid black fur, paint him or her like a skeleton with some pet-friendly white paint (i.e.. a brand that is lead/dye free, naturally pigmented, organic and with a vegetable and water base). Bonus points if it's a glow-in-the-dark paint! Hairy Potter. Wrap a Gryffindor scarf around your pet's neck, DIY some round glasses and even add a lightning bolt scar if your pet's fur allows it! Bride and Groom. Whether you have two pets or you're going trick-or-treating with a friend and their pet, there's nothing cuter than a four-legged bride and groom. Chia Pet. DIY a plant "shirt" for your dog using faux leaves or vines to turn him or her into a life-sized Chia Pet! Martini Glass. If your pet is wearing the "cone of shame" on Halloween, add a felt olive and a giant toothpick to turn it into a silly martini glass. Spider-Dog. If your dog isn't the type to wear a full costume (without tearing it apart, that is), then fashion eight long legs with pipe cleaners and fur to turn him or her into Spider-Dog!